decisions about their future ! returns and minimises RISK ! We can help you Maximise and Protect your Wealth so you generate solid returns and minimises risk. Let us help you Take Control of your Super so you can lead a comfortable, stress free retirement. Insurance is about Protecting your Greatest Assets. What would you and your family do without your income. You could be eligible for the Centrelink Age Pension as well as your income stream payment. Let us help you and your loved ones move to Aged Care. You don’t have to face it alone. Welcome to the Wealth Connexion Home Page ! Who is Wealth Connexion ? Wealth Connexion Pty Ltd was established with the ultimate aim of providing a more personalised financial planning service to a “boutique” client base. This approach has helped us grow to become one of the leading providers of wealth management advice in Brisbane today. Our company’s past and future growth is based primarily on personal referrals from satisfied clients whom wish for their friends and colleagues the same personalised financial planning service. 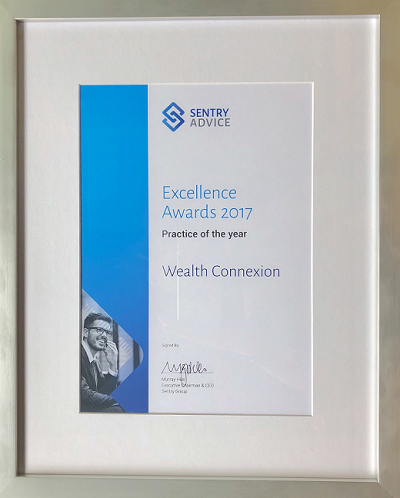 Jeff Stella, Alexander Kitchin and Stuart Engel (the directors of Wealth Connexion in Brisbane) are Authorised Representatives of Sentry Advice. This means that all three Directors and the Wealth Connexion staff have access to a financial services organisations that supports choice and opportunity for our clients. Who is Sentry Advice ? Sentry conducts business through a network of financial Advisers who are appointed as Authorised Representatives under Sentry’s AFSL. Where Sentry has appointed a corporate entity as an Authorised Representative, employees of that company who give advice will also be authorised by Sentry. Helping clients assess affordability – minimising fees or maximising entitlements can be a bonus outcome. Helping clients understand what decisions need to be made and what it will take to get them into the care they need. Providing choices for structuring finances and estate planning. Working with families to create peace of mind and a financial pathway to help transition their ageing parents with ease. Our advisers are experienced in providing Age Care Financial Advice having also attained industry recognised training as Accredited Aged Care Professionals. We are able to assist clients and their families to navigate what is a difficult and confusing time by providing a pathway to enter aged care where the decisions to appropriately arrange your finances have been thoroughly considered. Need help with Accounting, Legal Lending or SMSF Admin ? We understand that not everyone that seeks our advice has an existing network of professionals to help guide them through the financial planning journey. We have selectively chosen other professionals in the areas of Accounting, Legal, Aged Care, SMSF Administration and Lending that can assist you in implementing the Financial Planning Advice we provide. Wealth Connexion Pty Ltd ATF Wealth Connexion Unit Trust is a Corporate Authorised Representative of Sentry Advice Pty Ltd ABN 77 103 642 888. Sentry Advice holds an Australian Financial Services Licence (AFSL) No. 227 748 (Sentry).